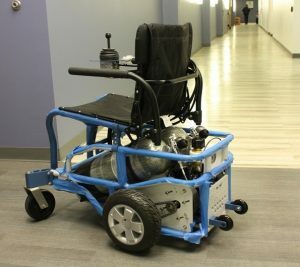 Designed, developed, and constructed at the University of Pittsburgh Human Engineering Research Laboratories (HERL), the patent-pending PneuChair™ pneumatic wheelchair uses high-pressured air as an energy source instead of heavy batteries and electronics. The chair weighs about 80 pounds overall and takes just 10 minutes to recharge, compared to 8 hours to charge an electric mobility device. HERL, which is a joint effort between Pitt, the U.S. Department of Veterans Affairs, and UPMC, was already working on a prototype of the PneuChair when it heard from representatives from Sports Outdoor and Recreation (SOAR), a nonprofit organization established by The Gordon Hartman Family Foundation of San Antonio to oversee Morgan’s Wonderland. They asked HERL for help in developing powered mobility for the new splash park. The maximum distance on one fully charged tank is around 3 miles, about a third of the distance an electric chair can travel before it needs to be recharged. Pitt and SOAR are looking to establish a long-term licensing agreement wherein the PneuChair could be used in a variety of markets — personal care homes, shopping venues, grocery stores, or airports.